With less than 24 hours before you walk into the exam center, what should you do? your test admission ticket - If you registered online, this was emailed to you and you must print it and bring it with you (an electronic copy is NOT acceptable!). If you registered by mail or phone, your ticket will be mailed to you. an approved photo ID - Find a list of accepted forms of ID here. You won’t be allowed to test without this, so make sure you have a proper ID! number 2 pencils - Take at least 3 sharpened number 2 pencils with good erasers. Don’t bother taking pens, mechanical pencils or highlighters. You won't be permitted to use them. an accepted calculator (with new batteries!) - A list of approved calculators can be found here. You should obtain an accepted calculator early on in your studying and practice using it so that you’re comfortable with it on test day. car keys - You can’t leave home without these! water - Even if you normally don’t drink anything all morning, you’ll want to have the luxury to sip on water during your test breaks. It will be a distraction and help you relax in between test sections. snacks - The ACT allows students to take a short break after the first two test sections. This break will be outside of the test room, meaning you’ll be able to eat and drink. Take advantage of this! There is nothing more distracting than a grumbling belly. Great snacks that are easy to eat and will power your brain include apples, granola bars, pretzels and trail mixes. Placing all of these items in a bag next to your door with ensure that you won’t be scrambling to remember something the morning of your test. Find the test center: Avoid any added stress on test day by finding the test center in advance. This will help you realize when you need to get up the next morning and when you need to leave the house. Mapping out your route to test center will make the morning of the test go by much more smoothly! Set an alarm: Make sure you wake up in plenty of time to do whatever you need to do before heading out the door and with way more than enough time to travel to the test center. It would be better to arrive 30 minutes early than even 30 seconds late! If you get to the test center after the clock strikes 8:00 AM, they may not let you through the door. Do not oversleep!! Eat a healthy dinner: Nothing will help you sleep better than a full belly, but make sure it’s full of something nutritious. Don’t fill up on hot wings that have the potential to keep you up all night. Eat something you like that your body is used to. Recommended pre-test meals include something with whole grains and vegetables. Try a stir fry made with brown rice or whole grain pizza covered with your favorite veggies. 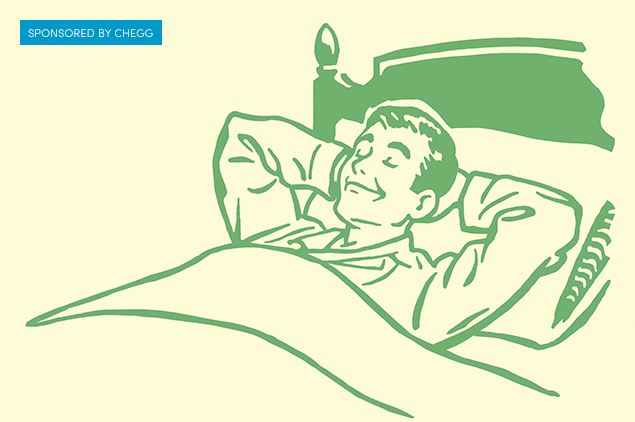 Go to bed early: Don’t stay up trying to study that one last tricky topic. Don’t stay up texting your friends about how nervous you are. Don’t stay up looking at Facebook to see who else is taking the ACT the next day. Don’t even log into Chegg for last minute tutoring! Go to bed. A good night’s rest is at least six hours, but ideally eight hours. It will go a long way in making sure you’re sharp on the big day! The best thing you can do the night before you take the ACT is relax: watch a movie, read a (non-ACT related!) book, take a long bath, go for a run. Do whatever stress-relieving activity works best for you. After that, give your body and mind the rest they need so that you can perform your best!